I haven't done much with this blog in quite some time. Personal social networking with some business posts included has been all the business promotion I have been doing the last year or so.....Maybe it's time to readdress. Please "like" my Facebook business page and I will hopefully start using that avenue soon. MARS: 03/2011: Mr. Ken S. Feldman: "Waste Not Want Not"
Mr. Feldman is a professor of chemistry at Pennsylvania State University. 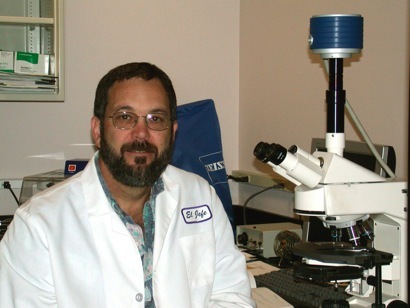 His research interests in the area of organic synthesis focus on two diverse areas: the synthesis of natural product molecules, such as the secondary plant metabolites known as ellagitannins and gallotannins, and the de novo assembly of organic zeolites with long-range periodic three-dimensional order. 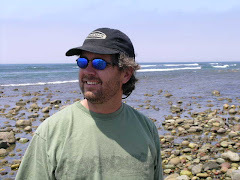 Mr. Feldman arrived at Harvey Mudd as a graduate of Miami Beach Senior High School in Florida and earned his Ph.D. in Chemistry in 1984 from Stanford University. 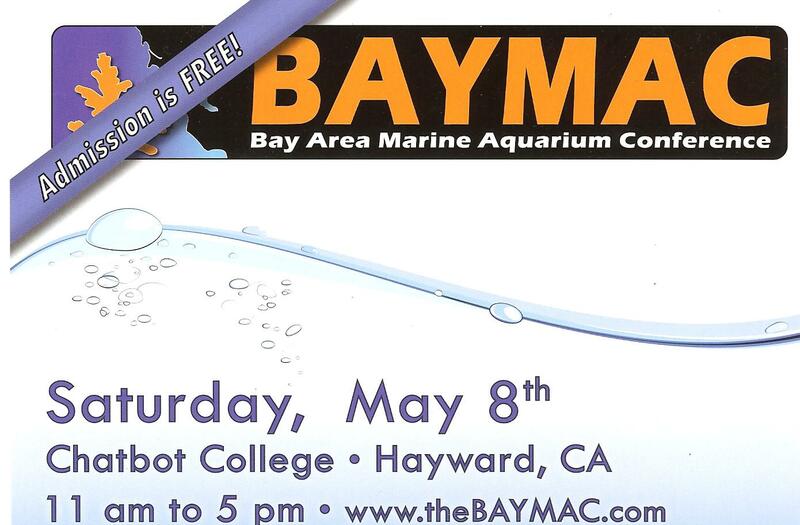 Mr. Feldman spoke to the Marine Aquarist Roundtable of Sacramento (MARS) on March 18th, 2011 meeting about organic waste in our reef aquarium systems. A BIG thank you to Ken for allowing me to post this recording for our members that were unable to attend the meeting to hear his talk. 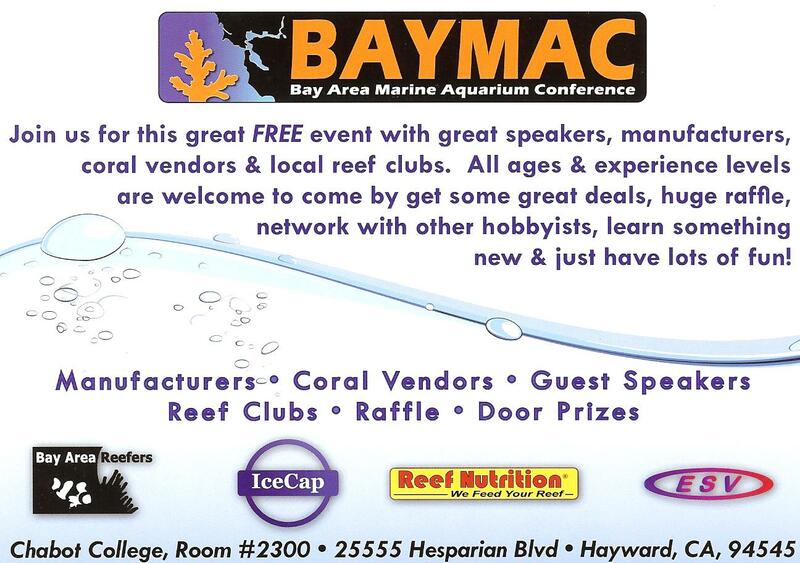 Print reference materials for this talk can be found on the Advanced Aquarist archive. 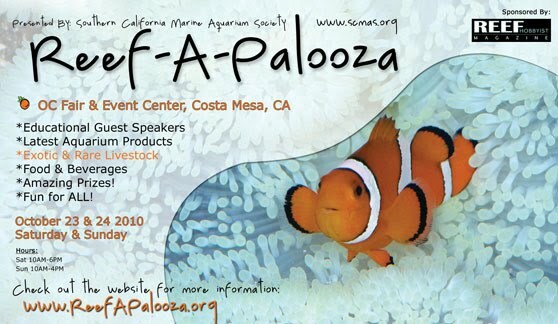 Last minute decision to attend this years Reefapalooza, Orange County Fairgrounds, October 23 & 24. Looking forward to hearing some great speakers and seeing many of my suppliers. 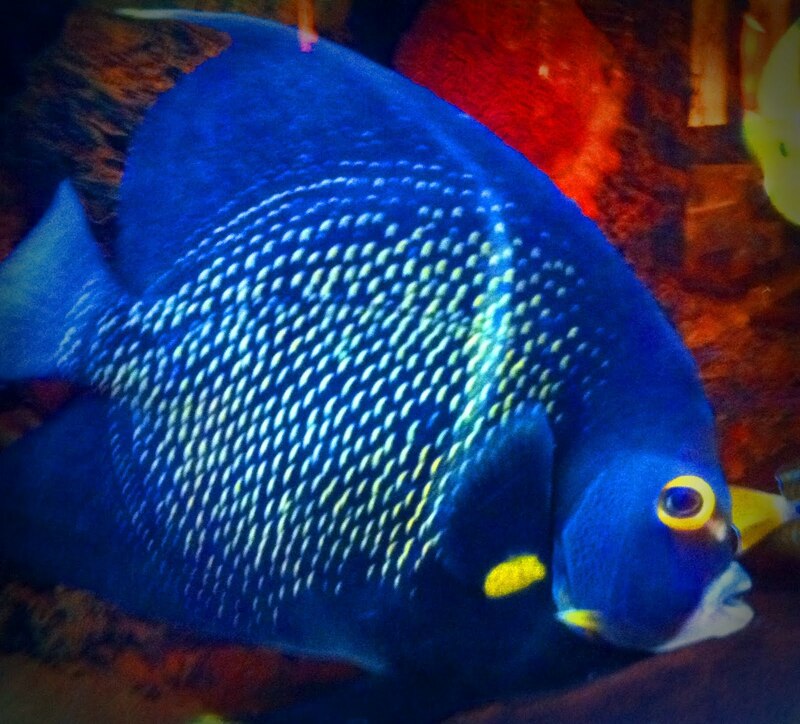 As far as size is concerned, Jennifer's aquarium in Glenbrook, NV is one of the smaller systems I maintain. But for the 70 gallons, it packs a ton of life. The combination of good flow, daily dosing of B-Ionic's Calcium and Alkalinity buffers and the feeding of Reef Nutrition's Arctic Pods, Phyto Feast, Roti Feast and Fuzzy Phytes creates a thriving environment. The Physogyra Bubble Coral is a large polyp stony (LPS) coral and is also referred to as a Grape Coral, Small Bubble Coral, or Octobubble. Its genus name, Physogyra, comes from the Latin words physa (air bubble) and gyros (wide circle), which describes its retractable, circular, bubble-shaped polyps. Its polyps are white to tan or green and look like a cluster of grapes or balloons with pointed tips when open during the day. Its behavior is aggressive and will use its long sweeper tentacles to sting corals that are placed in close proximity to it. It can also sting the reef aquarist who tries to handle it while its sweeper tentacles are out, so precautions should be taken when doing maintenance in the tank. The Physogyra Bubble Coral requires moderate lighting combined with low water movement within the aquarium. For continued good health, it will also require the addition of calcium, strontium, and other trace elements to the water. One of the hardiest corals obtainable, the Green Open Brain Coral can thrive in a wide range of conditions. "Green Metallic" simply refers to brighter colored specimens, not a different species. Acclimates best in mild water flow and low to medium lighting, but can adapt to a wide variety of conditions. These corals can expand tremendously larger than their skeleton once well acclimated. 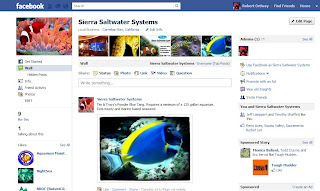 An excellent coral for beginners, and admired by experts. I gave Jennifer this coral as a birthday gift over a year and a half ago and it has probably doubled in size. 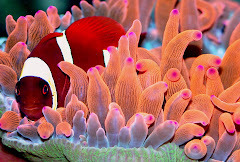 A pair of Ocellaris Clownfish have taken to it as a host. Though these corals are mostly photosynthetic, they benefit from the occasional bit of raw table shrimp, frozen mysis shrimp or silversides once a week. The tentacles of the open brain coral are retracted during the day and during this time the mantle will go outside of the skeleton and looks much different than it does at night. The second type of brain coral that is in Jennifer's aquarium is the Lobophyllia Brain Coral is a large polyp stony (LPS) coral often referred to as a Lobed, Colored, Carpet, Flat, or Open Brain Coral, Meat Coral, Modern Coral, or Large Flower Coral. It has fleshy polyps that hide its calcareous skeleton. It is found in a variety of textures and color forms. Some are smooth, while others are pimply, and look like carpet. Colors vary from bright red, green, orange, gray, tan, or brown. Green Star Polyps are a favorite coral for beginners and advanced hobbyists alike. The waving polyps flowing in the current add movement and color to the aquarium. 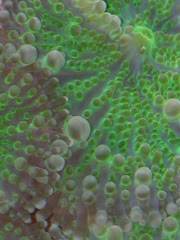 Green Star Polyps are often noted to be good indicators of water quality, and flow. They react quite quickly to changes in water parameters by not opening. It is very important to make sure your pH and Alkalinity are balanced to encourage growth and color of this flashy, easy to keep coral. The Fungia Plate Coral lives a solitary life atop the sand bed. 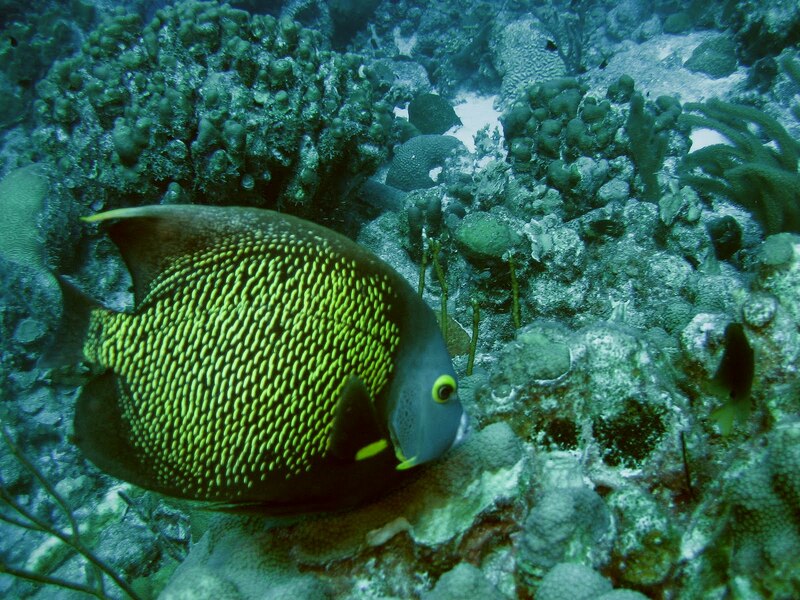 It requires low to moderate water currents and moderate reef lighting for proper health. 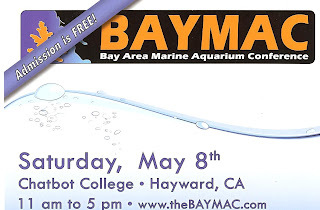 It is important that proper calcium and alkalinity levels are maintained. Place the Fungia Plate Coral on the sand bed along the bottom of the aquarium. Be careful when handling it to avoid damaging the delicate tissue on the underside. It does have short tentacles that can sting nearby corals so leave several inches between it and its neighbors. Be aware that it can move across the sand bed slowly. The Hammer Coral is a large polyp stony (LPS) coral and often referred to as Euphyllia Hammer Coral or Anchor Coral. 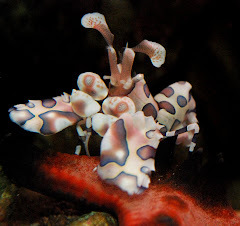 Its common names are derived from the appearance of its hammer-, or anchor-shaped tentacles. 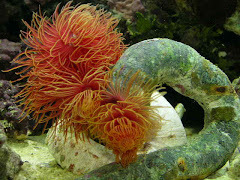 Its polyps are visible throughout the day and night and hide its skeletal base. It may be green, tan, or brown in color, with lime green or yellow tips on the ends of its tentacles that glow under actinic lighting. Like the GSP's, Jennifer's Xenia Coral has grown rapidly since its introduction, to the point that they need to be manually removed on a monthly basis. Pulsating Xenia has sturdy stalks up to 3" long which are tan in color. The end of the stalk is covered with a crown of feathery polyps, each carried on a stem approximately 1"-2" long. 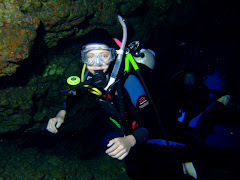 The polyps open and close in an attractive pulsing or pumping motion. Groups of these stalks form colonies that can spread into large mats. Xenia is one of the few corals that actually smells bad when removed from the water. Zoanthids are an ultra-colorful, vibrant coral species that adds life and vigor to any reef aquarium. Jennifer has at least three different colors of the Zoanthid coral and are multiplying and thriving in her aquarium Zoanthid corals colonize, meaning they reproduce and stick together to form a "colony" of zoanthids. 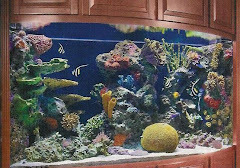 The best thing about them is they are easy to care for, are not very demanding, and are a fun and simple way to spice up a reef aquarium. And finally Jennifer's Rose Bubble Tip Anemone. The Rose Anemone is a highly prized, pinkish-reddish color form of the Bubble Anemone Entacmaea quadricolor. This is one the hardiest species of anemones in the aquarium, and generally thrives in any well-maintained reef aquarium. Jennifer's anemone came from a clone that I have had for many years which I received in a trade from a Marine Aquarist Roundtable of Sacramento club member. It is photosynthetic and requires good lighting and medium to strong water movement, but usually adapts to a wide variety of situations. Does not require supplemental feeding. Will attach to most any substrate or rocks. Regular (and less expensive) Bubble Anemones are also available. One of most forgiving anemones available. 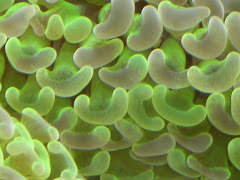 Jennifer's aquarium also contains three or four different colors of Ricordia Mushrooms from Idaho Aquaculture, Inc, a very nice Bali Green Slimer which has started to see some tremendous growth from the original one inch frag size. Also, a wonderful Hydnophora piece that also has grown well over the years. 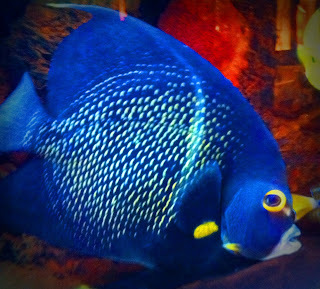 And.....I haven't even mentioned her wide variety (and cleverly named) fish! Remember, click on any photo to see in its full original size.